Justin Bieber is said to have rejected a concert to the tune of $5 million while the Republican National Convention took place just minutes away. According to the celebrity gossip publication, a source close to CAA the agency that represents Justin said the hitmaker was asked to perform 45 minutes away from Cleveland's Quicken Loans Arena - the setting of the RNC. 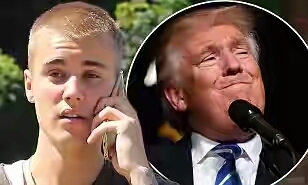 While assurances were allegedly made that the performance would be non-political, Justin's manager Scooter Braun is a known supporter of Trump's presidential rival Hillary Clinton, having even hosted a fundraiser for the Democrat candidate at his home in Los Angeles. It was reported that Braun mentioned to Justin that he should discuss erecting Black Lives Matter signs at the show, but the donors rejected the idea, suggesting All Lives Matter signs instead.